About Snyder Industries, Inc. | Snyder Industries, Inc.
Snyder Industries was incorporated in North Tonawanda, New York in 1972. Since that time, the company has been a quality-oriented contracted supplier of machined components for the heavy equipment industry. Manufactures of equipment such as above and underground mining machinery, construction, and heavy earth moving machinery utilize our finished products. 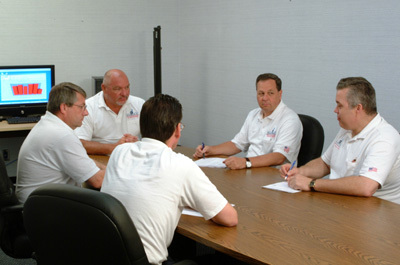 Snyder Industries has always striven for continuous improvement. In 1978, they purchased and installed the first CNC machine tool in Western New York. In 1993, the continual growth trend resulted in the addition of a 30,000 square foot state of the art heat treat facility. In 2006 it was again time to expand. A building was purchased with 110,000 square feet of manufacturing and 15,000 square feet of office floor space. With 50 foot ceiling heights, complete loading and shipping docks, and high-tech internal communication network, the new facility has allowed Snyder to consolidate all manufacturing processes into one building and continue expansion efforts. In 2013, Snyder Industries purchased an additional 30,000 square foot facility on the same property that is currently used for raw material storage and organization. Snyder Industries currently has about 200,000 square feet of manufacturing space under newly replaced roofing (2018). Today the company enjoys a strong relationship with its customers worldwide, and is dedicated to taking a proactive approach to the preservation of these partnerships. 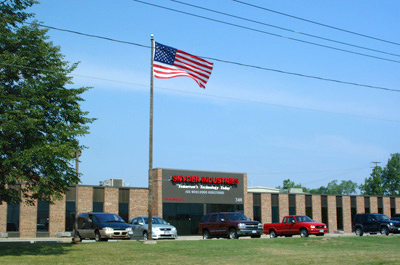 Snyder Industries utilizes state of the art equipment and processes in the manufacture of a wide variety of machined components. 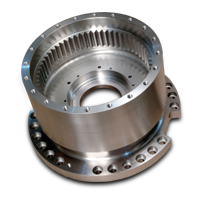 These components include: internal and external gears, planetary cages and housings, wheel units, drive shafts, haulage sprockets, bearing carriers, couplings and custom fabrication. Our CNC milling and turning equipment has a wide range of capabilities, ranging up to 79″ outside diameter x 61″ overall length x 17,640 lbs. table weight. In addition to machining, Snyder Industries utilizes in-house capabilities of several heat treatment and specialized metal treatment processes that may be required in the manufacture of a finished part. They include, quench and tempering, carburizing, induction hardening, gear hardening (utilizing the NATCO Intensifier method), shot peening, sandblasting and weld fabrication. Trained, quality technicians in our laboratory facilities perform all process verification functions. These include: metallurgical analysis, Mil standard 13165-C shotpeening verification, ISO certified physical measurement testing, and gear charting.